A family Friendly Bali Resort. 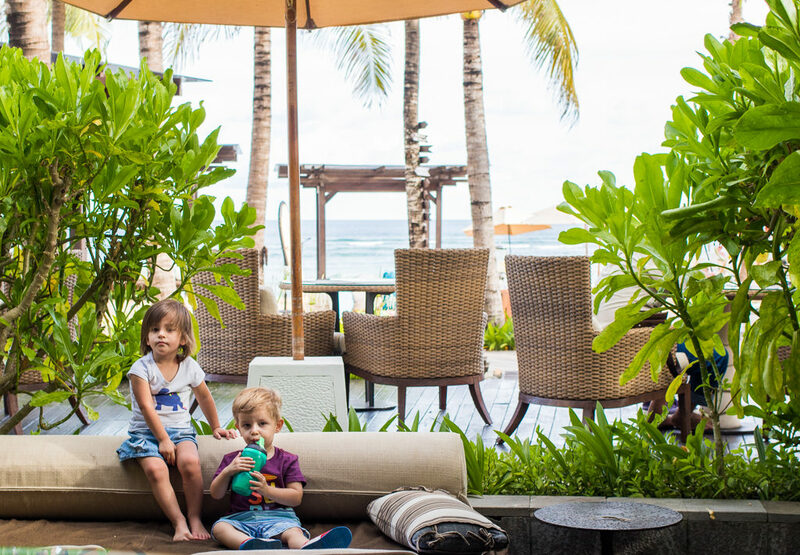 The Ritz Carlton Bali describes themselves as a family friendly resort, but do they live up to the claim? From the kids club to villa style rooms, there’s a lot to love about the Ritz Carlton Bali. However, it’s not all butterflies and rainbows ALL the time. The grounds are beautifully landscaped and well maintained. I loved walking the grounds at night (it’s how I get my kids to sleep when they’re jet-lagged). Since the resort is so large, they send “buggies” or golf carts to get you where you want to go, you just have to call 5 minutes ahead. We stayed in a 1 bedroom suite without a pool because I don’t like the mix of an unfenced pool and toddlers. If my kids were older though I would have opted for the suite with the semi-private pool right outside your door. They also have completely private villas with more bedrooms and completely private pools. 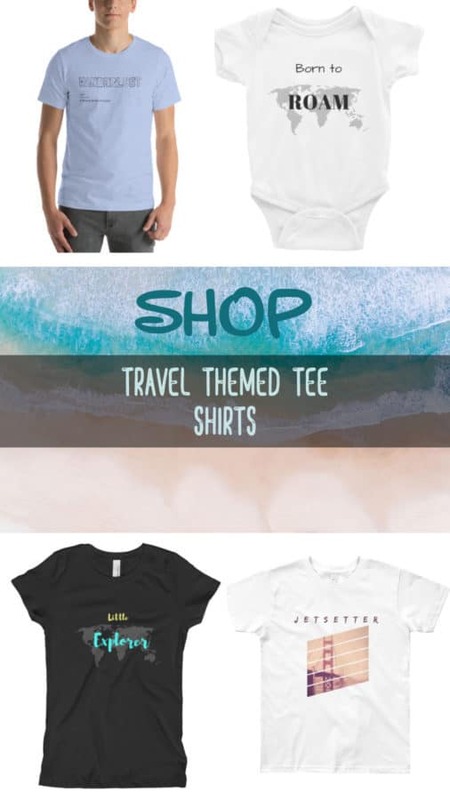 A great option when traveling with friends or extended family. The pool area was great. There’s a poolside ice cream cart and a short menu to order off of. I especially liked that the main pool had a very shallow section with lounge chairs in the water. So with young kids, they can splash around while you’re an arms reach away relaxing in the lounge chair. If you stop by the kids club on the way you can pick up pool and beach toys free of charge! 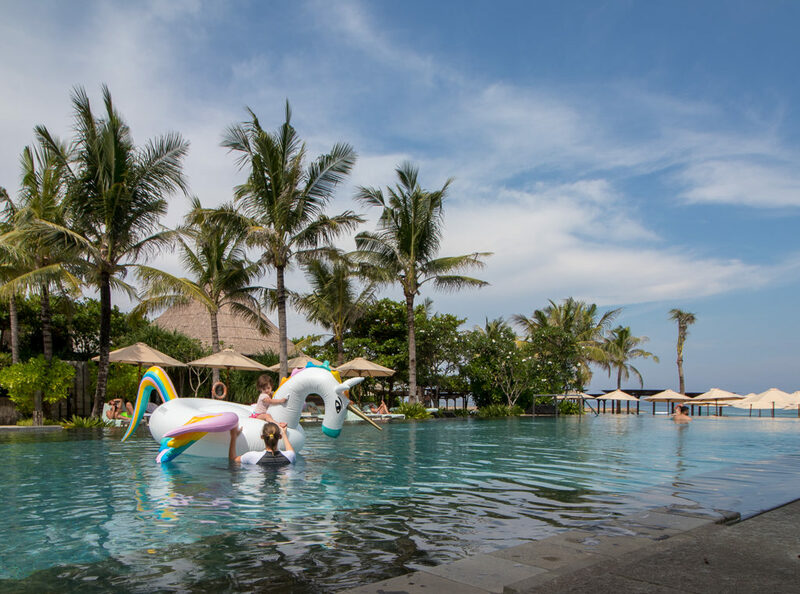 Nusa Dua beach is constantly ranked as one of the best beaches in Bali and since the Ritz Carlton Bali maintains the shoreline, the views are beautiful. Unfortunately, Bali has an ocean water pollution crisis on their hands. I entered the ocean exactly once and did not enjoy myself. It felt like there were a lot of particles in the water. I should mention that I am spoiled by amazing beaches back in our US home of Hawaii and the nearby beaches of Goa. It was also too rough to let my toddlers go in. I guess that’s why pools are so popular in Bali. We really enjoyed watching the camels walk along the shoreline though. The kids club “Ritz Kids” is fantastic. The designated kid’s pool is located here, and it was ALWAYS empty. We joked that it would have been silly to pay for a private villa pool when there was a private one right there with a water slide. I really appreciated that the whole pool was under shade. Inside of the kids, room was 2 large play zones for kids, library, a tv room – which can be left off if you ask, and computers were set up for older kids. The staff were SO friendly and great with our kids. You can go there with kids of any age but there is a minimum age to leave your kids in the kids club without you – I think it was 4. 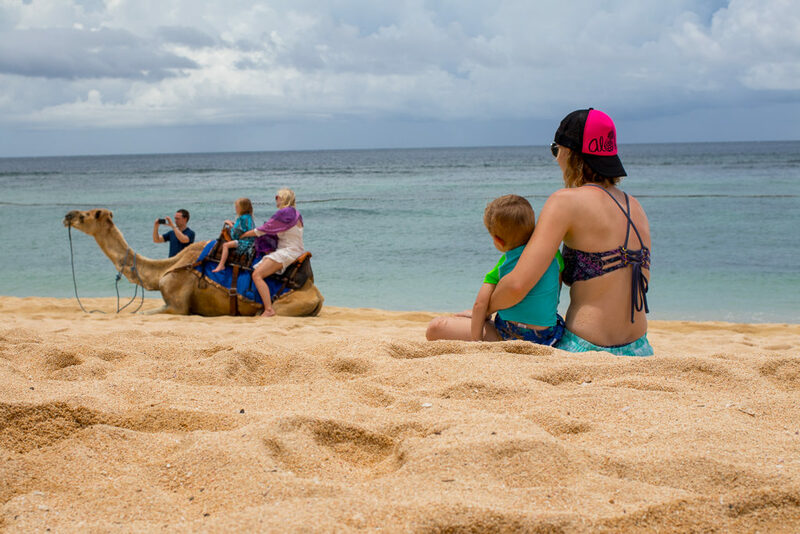 You CAN, however, hire a babysitter through the resort to stay with your kids in the kids club while you do adventurous or kid-free relaxing activities. That btw is one of my top kid’s club hacks – it works in most resorts around the world. Speaking of babysitters, the one we hired was amazing. I always vet hotels sitters (using this checklist) but it was clear she was qualified after the 1st few questions so I didn’t finish the whole interview. The first time I hired her it was a few nights in and I was really struggling to get my kids to bed at a decent hour because of the jetlag. I decided instead of struggling again I would go out for a dinner date with my hubby and hire a sitter. I honestly planned to come home and put them to sleep after because they had been going to bed so late. That baby whisperer had them both sound asleep when we got back and she was peacefully reading a book on the couch. 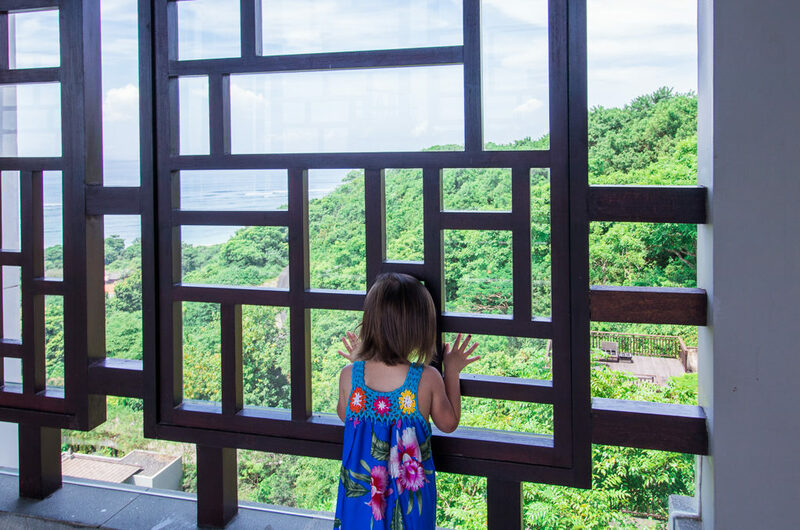 The kids club also hold fun and educational activities throughout each day such as Kite flying, Lantern making, kids spa, cooking, nature walks with plant education, cultural lessons, dancing, beach volleyball, crab discovery, koi fish feeding and a lot more! They will even set up a “kids safari” in their room with a tent and flashlights. I took the perfume workshop at the resort. 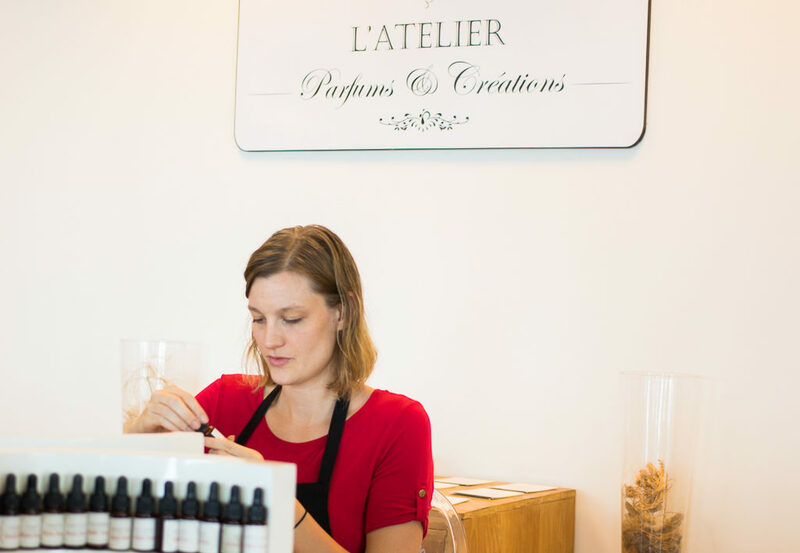 It’s a private 1.1 lesson and you walk away with a custom perfume that you’ve created yourself. Apparently, Bali is famous for providing scents to major perfume companies around the world. I named mine Bali Bliss which my husband tells me is cheesy but whatevs, he won’t be wearing it. Many of the scents are natural so you can create a perfume without any added synthetic chemicals. The Ritz Carlton spa is GREAT. Overpriced, but great. They sometimes have specials and sales so ask before you book from the spa menu. There are many dining options, many have open views or outdoor seating. My favorite Breezes Tapas Lounge which has giant beach style loungers and great food. Everything we ordered via room service was great except for the Pad Thai. It was probably one of the worst Pad Thais I have ever had in my life – so don’t get that, unless undercooked fishy tasting noodles are your thing. Try some delicious local dishes! A buffet breakfast was included. Living in Asia, I, spoiled by the local buffet breakfasts – peeps in the US, you don’t know what you’re missing. This breakfast buffet did not disappoint. I had bronchitis during our whole trip so the ramen bar in the morning was like heaven for my throat. There was a cute kids table set up at eye level for little ones but it was mostly unhealthy items – great for dessert though. Kids under 2 eat free. Not just at the breakfast buffet either. They can order anything off of the kid’s menu at all restaurants and even in-room dining. We aren’t just talking chicken strips and fries either. The kid’s menu offers 3 courses, freshly squeezed juices, and healthy mains. For example, my daughters favorite was steak, mashed potatoes, and veggies with a fruit bowl dessert and freshly squeezed watermelon juice to drink. Amazing. This is where the Ritz Carlton fell short. We kept running into issues of having to wait a long time for things. For example, at breakfast on more than one occasion, they sat us at a table and said they would be right back with highchairs…. But they forgot about us. Another time they didn’t have enough high chairs but instead of telling us that in the first place they said they would bring one in a few minutes. Despite arranging ahead of time, we had to wait more than 25 minutes for our car at checkout and it was unbearably hot that day. Then there was an issue with our room, they refused to move us. We even thought about getting another hotel at that point. 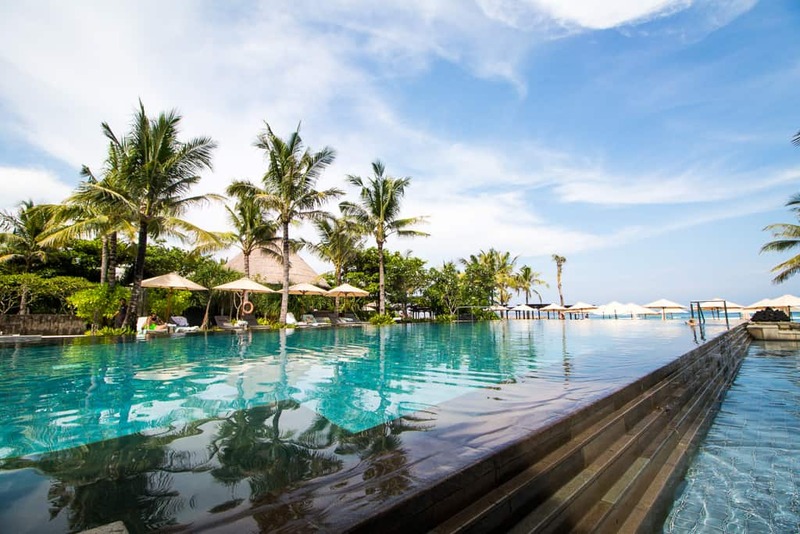 The Ritz Carlton Bali is located on the south of the island in Nusa Dua about thirty minutes from the Bali airport. 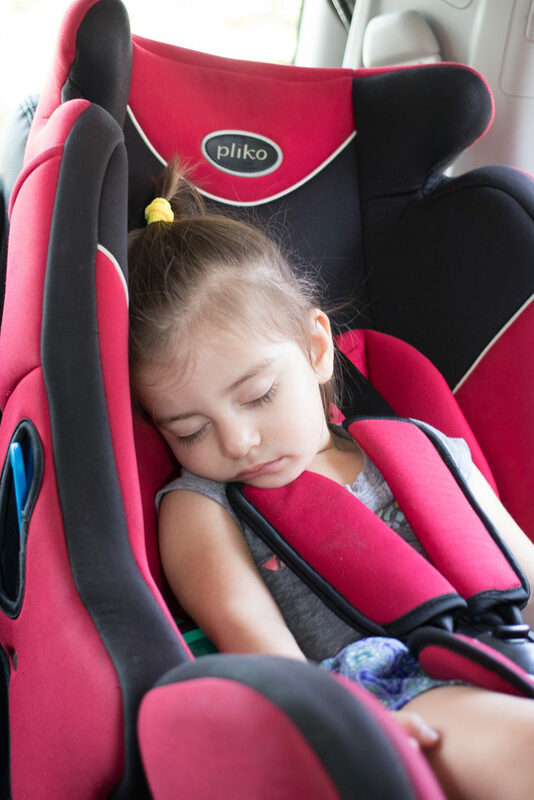 They will arrange for hotel pickup and drop-offs and will make sure car seats are already in the car so long as you tell them beforehand. Once you get there they offer a refreshing beverage at check-in. There’s a special check-in table for kids complete with a sticker activity book, and stuffed animals. Should YOU stay at the Ritz Carlton Bali? In the end, despite all the issues with poor customer service I definitely recommend this resort to families. 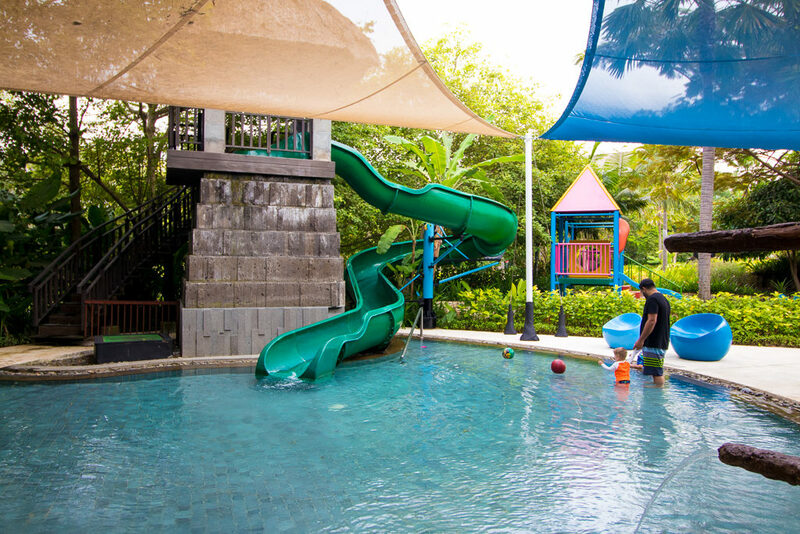 The pool, grounds, views, activities, kids club, babysitters and dining are all fantastic! The ability to leave your kids in a safe, fun and educational environment while you get some much-needed r&r is priceless and that’s where the Ritz really shined. 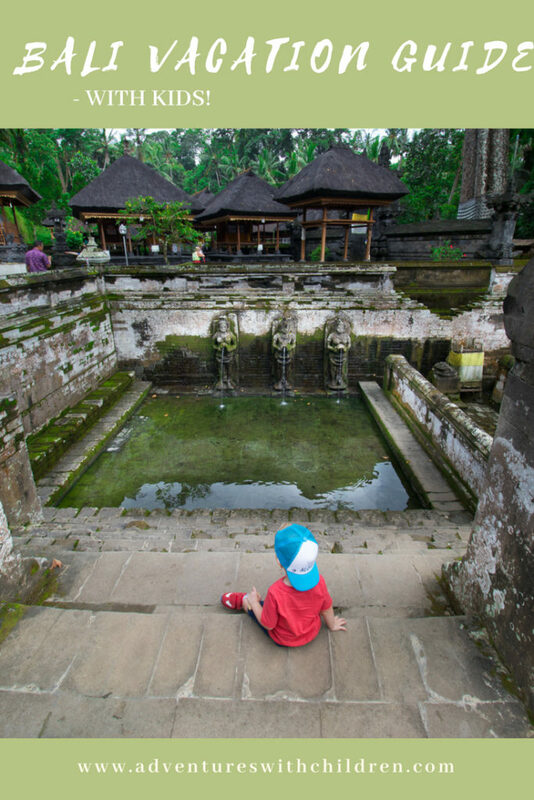 Don’t miss our Bali Vacation guide! !